Requests for all Trinity undergraduate and graduate courses, as well as courses offered through the Pratt School of Engineering, are submitted to the Office of Curriculum and Course Development and reviewed by the Faculty Committee on Courses, a standing committee of the Arts & Sciences Council. For help submitting a request, see the Guide to the Duke University Course Request System. To request access as a department affiliate, contact the Office of the University Registrar (registrar@duke.edu). 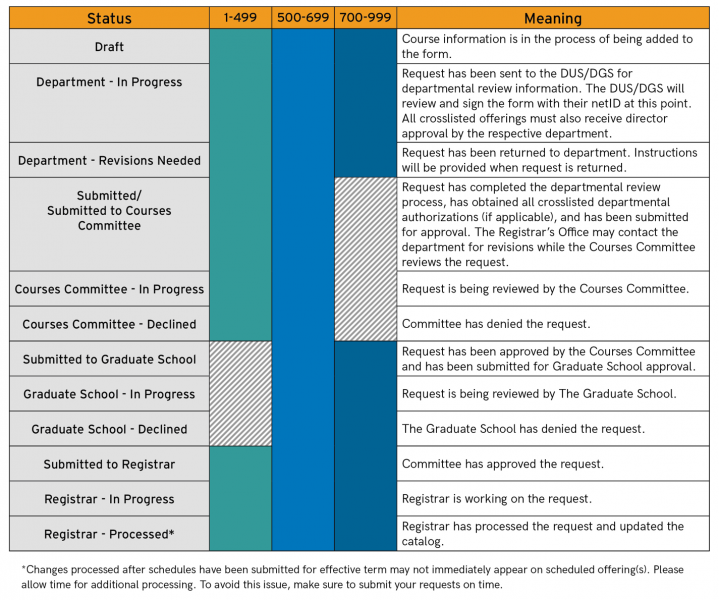 The Status column identifies the progress of requests in the Course Request System. Once a request has been reviewed by the committee, the status will read either Submitted to Registrar (Approved) or Courses Committee – Declined. Users should look at the bottom of the request in the Courses Committee Review section to see if there are any committee comments. Approved curriculum codes will appear at the bottom of any request; if codes are denied, the decision will be explained in the committee’s comments. Effective Fall 2012, the Duke University course numbering guidelines reserve certain catalog numbers for specific types of courses. 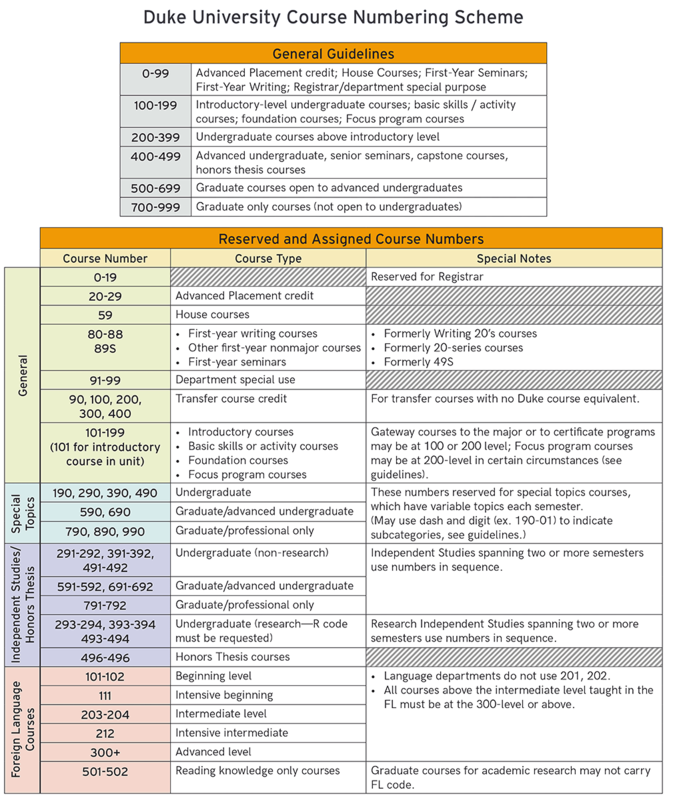 Consult the charts below before selecting a number for a new course or crosslist. This scheme is applicable to the following Duke schools: Trinity School of Arts & Sciences, Pratt School of Engineering, Nicholas School of the Environment, Sanford School of Public Policy, and The Graduate School. Catalog numbers are unique to each course and cannot be reused within four years of inactivation. Courses offered under the special topics course numbers (n90) are courses that are offered on a one-time basis; they are not part of a department’s regularly taught curriculum (permanent courses). Special topics are used by faculty who wish to teach a very specialized subject on a one-time basis, or to try out a new course that may eventually become a permanent course. Special topics may also be used for specialized courses taught by visiting faculty. Because the particular topic will be different each time the course is taught, departments must apply for the appropriate curricular codes using the Special Topics form on the Course Request System each time the course is offered. Please note that even if a particular topic has been offered in a previous semester, the curriculum codes will not carry over on DukeHub unless the Special Topic Request form has been submitted for the current semester. The topic title and any cross-listed offerings in the request must match the primary department’s submission in the DSV; requests that do not match exactly will not be reviewed until any issues are rectified. Only approved special topics courses and curriculum codes may be advertised by a department. Departments should confirm that their special topic titles and codes have been approved and applied to the schedule of classes before promoting them on a departmental website or social media account. For additional information regarding special topics courses, see Trinity’s guidelines for Course Requests. To find previous course requests, search either the Archived Course Requests (contains requests from June 2004 through December 2011) or the Old System (contains requests from January 2012 through May 2015). A link to both pages can also be found at the top of the website in the Course Request System. Both the Archived and Old System sites are read-only sites and are made available for departments to use for informational purposes only. New department affiliates should contact bulletins@duke.edu to request access to the archived systems. All Duke professional schools, except the School of Medicine, should use the Course Request Form to add, revise, or drop courses from the course catalog. One action may be requested per form. This form should not to be used to request changes to the class schedule for any particular term. Users will receive an email summary of the request upon submission and another when the request has been processed. Please direct all inquiries regarding the form to bulletins@duke.edu.